Soil Gas (Vapor) monitoring implants are installed with APICs Geoprobe® 6600 machine by hydraulically advancing probe rods to the desired depth. Geoprobe implants are stainless steel screens that can be inserted down the bore of a rod and anchored at depth. Geoprobe implants are unique in their ability to be "Post Run"... they are not carried in the rod during driving, but rather inserted down the bore when the appropriate depth has been reached. Once the implant is slid down the bore, it is simply rotated to attach it to the anchor point used during driving. As rods are removed from the hole, the implant and associated tubing remain firmly anchored at the bottom. Soil Vapor Implants can be installed for long-term vapor extraction, sampling or remediation strategies. The Geoprobe system is used to collect soil-gas samples through disposable Post-Run Tubing (PTR), which runs from the tip of the probing unit to a purging pump located in the rear of the Geoprobe van. The Post Run Tubing System (PRT) is an ideal tool for locating and delineating contaminated areas when used properly. It allows the user to collect soil vapor samples quickly and easily at the desired sampling depth WITHOUT the time-consuming complications associated with rod leakage and contamination. 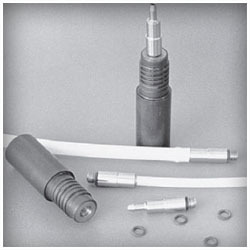 O-ring connections enable the PRT system to deliver a vacuum-tight seal that prevents sample contamination from UP hole, and assures that the sample is taken from the desired depth at the BOTTOM of the hole. 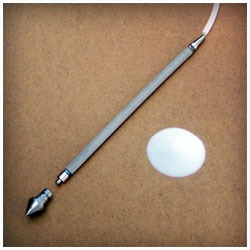 The sample is drawn through the point holder, through the adapter, and into the sample tubing. The tubing can be replaced after each sample, thus eliminating sample carryover problems and the need to decontaminate the probe rods. The resulting time-savings translates into a higher productivity rate for you and your client. Increases speed and accuracy of soil gas sampling. Eliminates problems associated with rod leakage and sample carryover. Utilizes simple design for ease of use and vacuum-tight probing. Sampling train and all connections can be checked to verify leak-free status. Requires no management of inner tubing during probing. Rapidly define the extent of VOC contamination in the subsurface, under appropriate conditions. Rapidly define potential source areas of VOC contamination over large or small areas. Determine the types of VOC contamination present in the subsurface at a facility. Rapidly define the potential extent of groundwater contamination and down gradient migration of VOC's under appropriate conditions. Determine presence, extent, concentration, and types of landfill gasses (methane, carbon dioxide, et.) present in the subsurface at active and abandoned landfills. Locate potential sources and delineate plumes of perchloroethylene (PCE) associated with active or abandoned dry cleaning facilities. Locate potential source and delineate plumes of carbon tetrachloride (CCI4) associated with active or abandoned grain storage facilities. Locate potential sources and delineate plumes of benzene, toluene, ethyl benzene, and xylenes (BTEX) associated with active or abandoned gasoline storage facilities [both underground storage tanks (UST) and above ground storage tanks (AST)]. Locate potential sources and delineate plumes of chlorinated solvents, including compounds such as trichloroethane, trichloroethylene, dichloroethane, and dichloroethylene, associated with active or abandoned facilities where degreasing or metal plastic parts cleaning operations were conducted. Connect expendable drive point to Post Run Tubing expendable point holder. Adapt PRT point holder to 1.5" steel rods. Advance rods to predetermined depth. Release expendable point and expose end of probe by retracting rods approximately 6". Connect PRT tubing adapter to client selected tubing. Connect tubing to PRT point holder. Seal drill rods at surface of borehole and top of the rod where tubing is inserted using hydrated bentonite to inhibit surface air infiltration into the system. Allow bentonite to hydrate and conduct leak test. Allow at least a 30 minute equilibrating period before purging and collecting soil gas sample.